The remarkable story of Hollywood's most prolific and influential writer-director-producer, the legendary Roger Corman, is the subject of director Alex Stapleton's affectionate, witty and hugely entertaining documentary, Corman's World: Exploits Of A Hollywood Rebel, which charts the Oscar winning filmmaker's career from his early days working in the mail room at 20th Century Fox to the set of one of his most recently produced "creature features", Dinoshark. Essential viewing for every cineaste, Corman's World has been described as "a delightful tribute" (Variety) to a true Hollywood great and one that proves to be thrilling, fun, informative and frequently touching (witness a rare and genuinely emotional scene featuring Jack Nicholson that, alone, makes this an unmissable documentary). Leaving no doubt as to Corman's seminal influence on modern-day cinema, the film features enlightening interviews with an incredible cavalcade of Hollywood icons, luminaries and A-listers (many of whom began their own careers working under Corman), including Jack Nicholson, Robert De Niro, Martin Scorsese, Ron Howard, Joe Dante, Quentin Tarantino, John Sayles, Jonathan Demme, Eli Roth, Peter Fonda, Peter Bogdanovich, William Shatner and countless others. Combining archival footage with contemporary clips and interviews, Corman's World chronicles how one man created an empire, cultivating undiscovered talent and pushing the boundaries of what independent filmmakers could achieve when working outside the studio system. From Corman's original genre-defining works such as The Fast And The Furious, The Little Shop Of Horrors and his classic film adaptations of Edgar Allan Poe stories, to his distribution of the art house films of Bergman, Kurosawa, Fellini and Truffaut and his continuing work as one of the world's leading independent film producers, Stapleton's superb documentary recounts a career that has spanned an astonishing six decades. 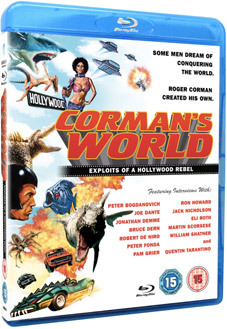 Corman's World: Exploits Of A Hollywood Rebel (cert. 15) will be released on UK DVD and Blu-ray by Anchor Bay Entertainment on 26th March 2012 at the RRP of £15.99 for the DVD and £19.99 for the Blu-ray. Rather surprisingly, no extra features have been listed.